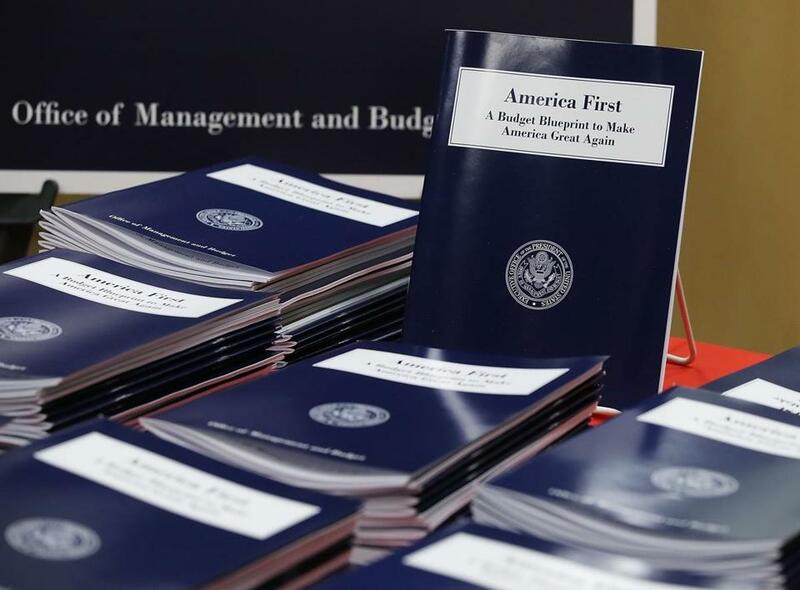 Copies of President Trump’s overview of budget priorities for FY2018, on display at the Government Publishing Office and the Office of Management and Budget on Thursday. 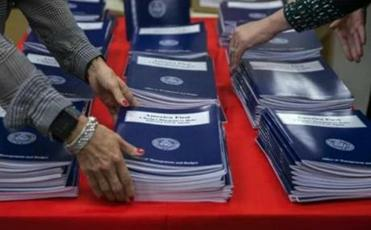 There are three letters that best describe a presidential budget plan: D.O.A. Presidents go through the motions of putting together a budget for the upcoming fiscal year. They give it snappy titles like “America First: A Budget Blueprint to Make America Great Again.” They send it to Congress with great fanfare — and then, generally speaking, it gets discarded and Congress writes its own plan. Still, budgets tell us a great deal about a White House’s fiscal priorities — and with Trump’s budget, we are reminded again of the cruelty and mean-spiritedness of this administration. There are few winners in Trump’s proposal, but they are a familiar group — the military, veterans, and law enforcement. Even though the United States faces no significant military threat, and even though China is slowing its military spending and Russia is cutting theirs, Trump is proposing a $54 billion increase to America’s already bloated military budget. That number is almost equivalent to what Russia spends in total on its national defense. Trump would also spend more money on border security agents, immigration judges, and, oh yeah, that wall along the US-Mexico border. Remember how Mexico was going to pay for that? Not so much. Trump is requesting $1.7 billion from Congress this year and another $2.6 billion in 2018 for it. Yet Trump’s budget would make America decidedly less safe. A 31 percent cut in the budget of the Environmental Protection Agency will leave Americans more vulnerable to dirty air, dirty water, and a dirty environment. The Trump budget would also cut all US funding for United Nations climate change initiatives, even though there is no greater threat to global peace and security than climate change. An 18 percent cut in the budget of Health and Human Services would mostly be borne by the National Institutes of Health, as well as programs to train medical professionals. But then again, it’s not as if medical research — or nurses and doctors — ever saved any lives. And only in the Trump Administration’s child-like understanding of national security would a huge increase in military spending paid for by a 28 percent cut in the State Department’s budget make America safer. Underfunding diplomatic efforts reduces American influence on the global stage, and cuts to foreign aid programs undermine international peace and security and increase the potential for global instability. But the real story here is the cataclysmic effect Trump’s dystopian budget will have on the lives of ordinary Americans. The proposal would end federal support for the Meals on Wheels program, which provides hot meals to seniors who can’t leave their homes. It also cuts food stamps and nutrition programs intended to benefit women and children and even eliminates a program to help provide low-cost home energy assistance. Funding for rental assistance and homeownership programs, as well as other antipoverty programs, are on the chopping block too. It cuts job training programs and federal spending for before- and after-school programs. It would take a sledgehammer to public transportation programs like Amtrak, rural airports, and grants for subways and light rail, which will raise the costs of travel, increase commuting times, and harm economic productivity. Cuts to the Agriculture budget would end programs that fund water and sewage systems — and even the federal flood insurance program would take a hit. America has one of the highest rates of poverty in the developed world, sky-high levels of income inequality, and low levels of social mobility. And yet, the Trump budget is focused on “protecting” America from international terrorists, who kill fewer Americans every year than falling televisions. In short, this a proposal that will make Americans sicker, poorer, more stressed, less educated, less financially secure, and decidedly unsafe. Thankfully, it’s a budget that will be going nowhere on Capitol Hill, even with Republican majorities in the House and Senate. But it tells us, unfortunately, everything we need to know about the cruel, heartless man sitting in the Oval Office.